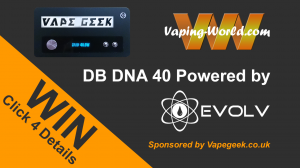 VapeGeek.co.uk have teamed up with Vaping World to offer this amazing device one lucky person. You will have a chance to win this regulated box mod which has the new temperature protection chip by Evolve and built by HCigar. So how do you get chance to get your hands on one of these beauties…. Simple Subscribe to the Vaping World YouTube channel here if you have not done so already, join Vaping Worlds Face Book Group here and put a post in the competition thread with your You Tube Subscriber name. 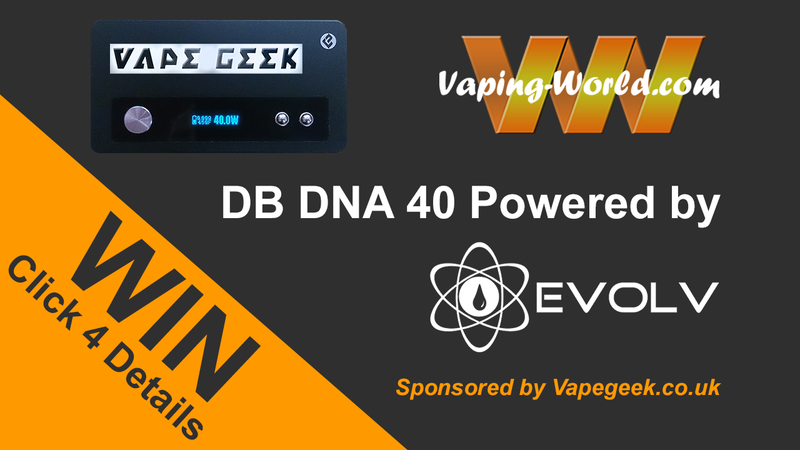 This entry was posted in Competitions and tagged competition, dna, DNA 40, evolv, HB DNA 40, HCigar, Regulated Box Mod, Vapegeek. Bookmark the permalink. Thanks for this gents, and thanks to VapeGeek.co.uk too! Just leave your name under the youtube video. Youtube name ‘Chris Sisson’. Thanks for the giveaway!! Youtube Name is “Viken Emesh”. Thanks for the offer! Youtube name [Schematic] Thanx for the chance! Sumit Atre on Youtube and Suminderji on FB. Thank you for this… I have wanted one since it came out but never could afford it. Make sure you join the Facebook Group here https://www.facebook.com/groups/vapingworld/ and put You Tube name in the competition thread. And thank you for all the comments. Ok, finally I have found the right place to comment for the prize. I think??? Anyway I feel like I am in a maze trying to figure it all out. I was told to leave a comment in the competition whatever. Well here go nothing. My youtube name is Kaycee777. My facebook page name is Karl Chacra. There, I’ve done it. Whew!! !